Vietnamese desserts stand out amongst most other sweet dishes worldwide because of the unique, out-of-the-box ingredients added in preparing them. 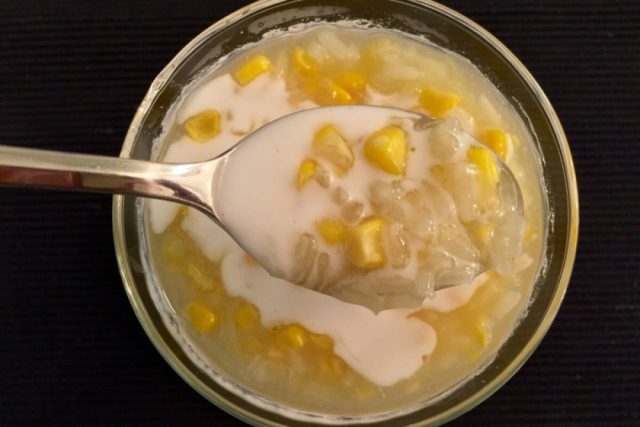 Those having a sweet tooth along with the desire to explore a variety of delicacies would find extreme delight in trying out the Che, a traditional name for any pudding, dessert soup and beverage in Vietnam, made from kidney beans, mung beans, cassava, taro, tapioca, jelly and much more. Baked and steamed sweet dishes, on the other hand, prepared from bread or cake is traditionally referred to as “banh.” Let us check out the list of Che, Banh and other tempting desserts which would prompt you to do away with your dieting goals. 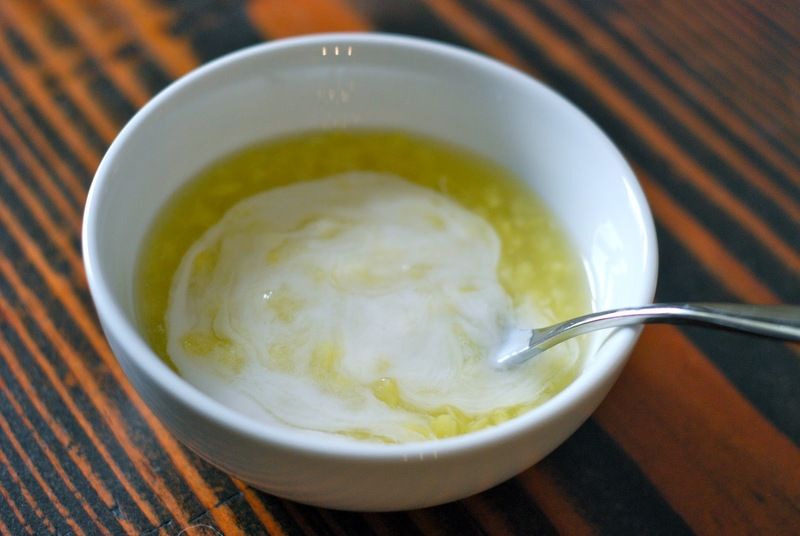 What is it: A staple, easy-to-find dessert available throughout the year, having three essential ingredients namely yellow mung beans, red beans and green jelly with a topping of coconut milk. What does it taste like: The unison of the three things alongside coconut milk would create a sweet sensation in your mouth. Team it with ice cubes to replenish a soothing beverage on a hot summer month. Go the traditional way by having it in a bowl or cup, using a long spoon. 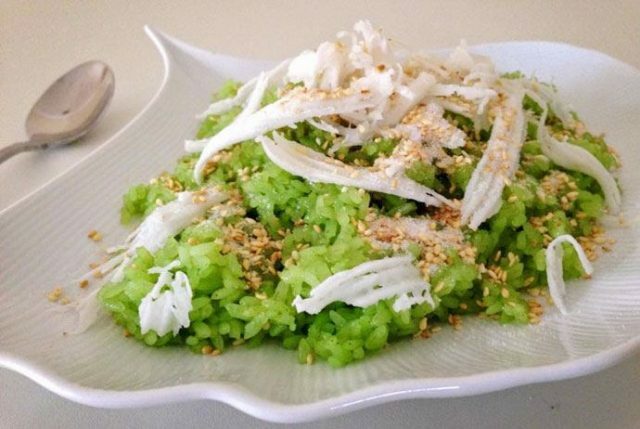 What is it: A perfect breakfast or snack recipe consisting of glutinous rice, pandan leaves, and coconut milk. What does it taste like: Besides the aromatic flavor of pandan leaves that would transcend you to a different world altogether, this dish gives you the privilege of satisfying your sweet and salty taste buds at the same time. A bonus would be the nutty and crunchy taste brought about by the sesame and coconut garnish. You can also prepare a simpler version of this dish where the pandan leaves can be substituted with any food coloring of your choice. 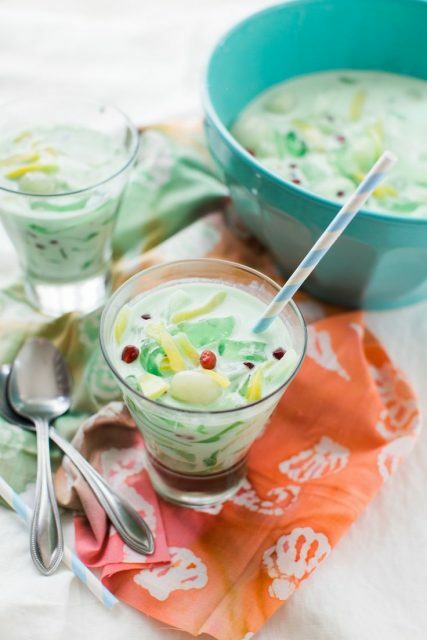 What is it: A yummylicious dessert soup made from mung beans and coconut milk, serves as a refreshing treat during summer because of the cooling properties of green mung beans. However, you can even have it as a warm soup during the chilling winters. What does it taste like: The versatile taste of mung beans makes this dish a blend of sweet and savory. The addition of coconut milk adds to its crispiness and crunchy flavor. 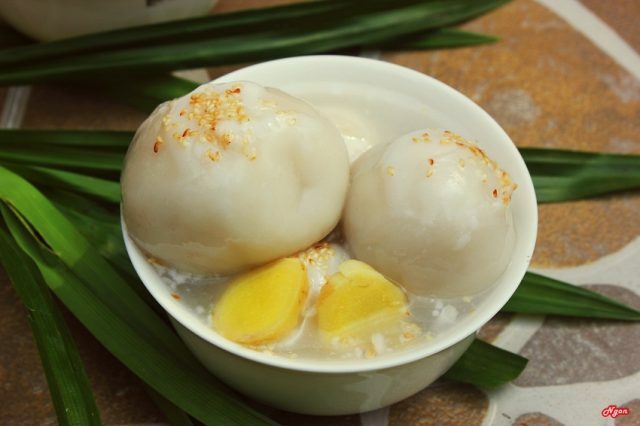 What is it: Also referred to Che xoi nuoc, it is a traditional sweet dish comprising of glutinous rice, stuffed with a paste of mung beans, seasoned with ginger syrup and a topping of sesame seeds or even coconut milk. Giving an impression of a dessert wading in water, this dish is mostly served on special occasions like the Lunar New Year or a child’s first birthday. What does it taste like: A unique flavor indeed where the gummy texture of rice mingles with the soft paste of mung beans, creating a sensation of its kind in your mouth. 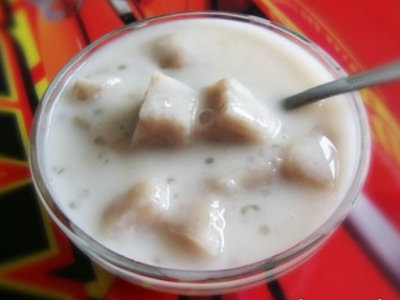 What is it: A mouth-watering soup-like dessert made with taro pieces sliced into cubes, along with tapioca and coconut milk. What does it taste like: The sweetness of taro teamed with tapioca and coconut milk, creates a sugary fusion, giving you immense delight particularly when eaten chilled. 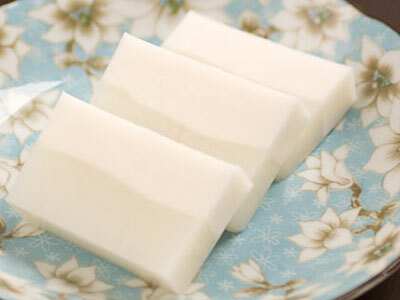 What is it: A sugary fusion of silken tofu cubes immersed in soy milk and ginger syrup. 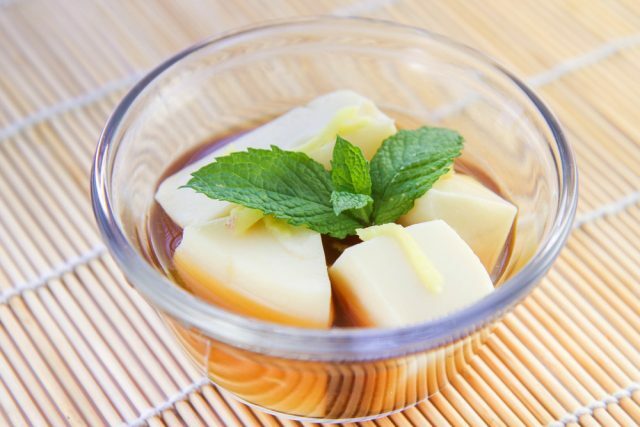 What does it taste like: The fusion of the soft, creamy tofu cubes and the aromatic ginger syrup would be utterly tasty. 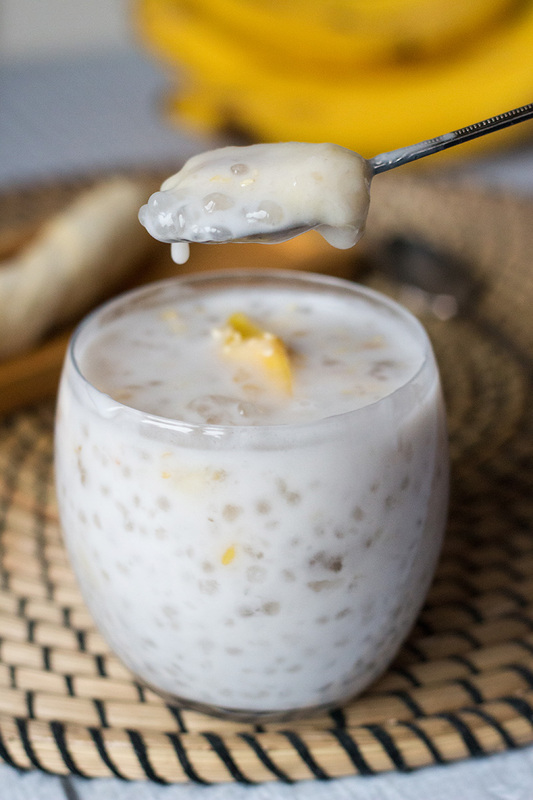 What is it: A traditional Vietnamese pudding featuring bananas, coconut cream, and tapioca pearls, with sesame seeds and mangoes, often added for garnish. Ripe, sweet bananas, must always be chosen to give your pudding a sweet taste and thick texture. What does it taste like: The perfect amalgamation of bananas, coconut cream, and tapioca would compel you to lick the last bit of your bowl. Have it warm as it might turn a little starchy when cooled because of its tapioca content. What is it: A cool, refreshing fruit cocktail perfectly suited for a hot summer day, having a whole lot of fruits available in the Asian markets as its ingredients like litchi, jackfruit, longan, palm seeds, and pomegranate seeds. What does it taste like: As you transfer a spoonful of this delicious fruit punch to your mouth, the diverse taste of the plethora of fruits would leave you craving for more. It would indeed be a great evening snack or a relaxing drink when you want a respite from the scorching weather. 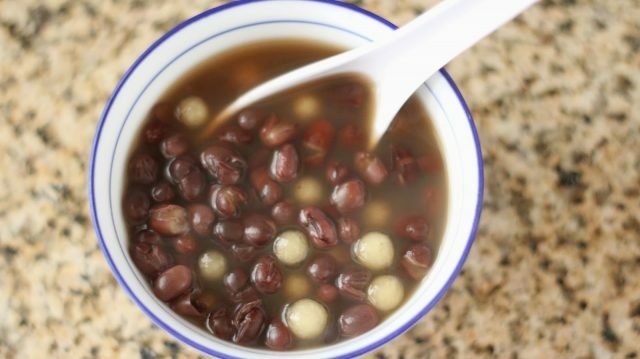 What is it: A red bean soup dressed with coconut milk. What does it taste like: Provides a refreshing flavor, with the earthy taste of red beans and the sweet, smooth flavor of coconut, making it apt for a starter or as a relaxing beverage after a long day’s work. What is it: A tri-colored jelly-like dessert prepared from coffee, coconut milk, and pandan. What does it taste like: Soft and sticky, with the aromatic flavors of coffee and pandan complementing the sweet taste of coconut. 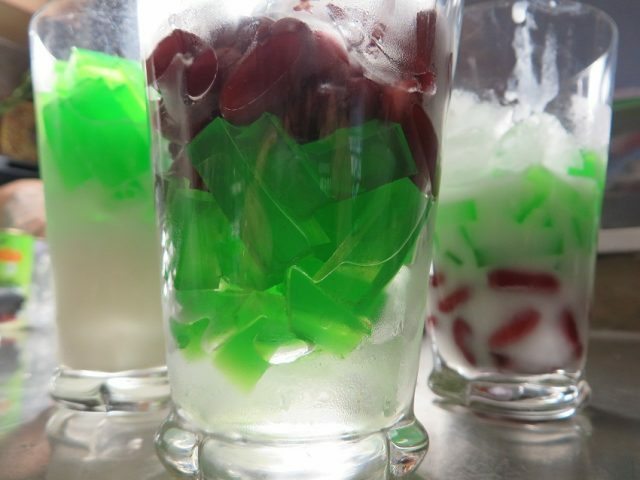 What is it: Another fabulous Vietnamese jello recipe having coconut juice as its prime ingredient, alongside agar agar(jelly-like substance). What does it taste like: Soft and sweet, with the taste of coconut dominating above all. 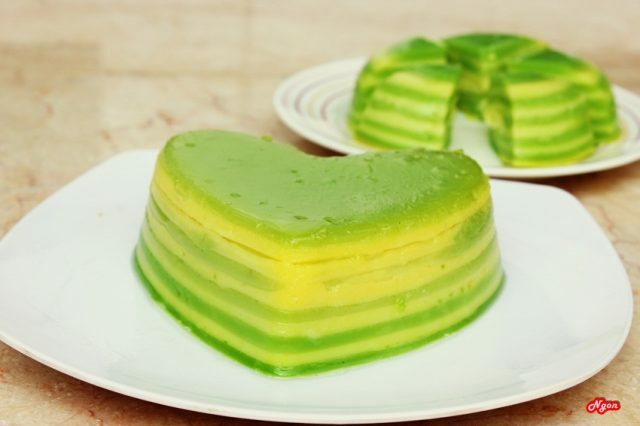 What is it: A layered cake made through the process of steaming, having tapioca starch, mung beans, taro, rice flour and coconut milk as its primary components. What does it taste like: A mildly sweet cake with a chewy and sticky flavor that gets prominent with every bite. Many households often include it as a part of the dessert recipe to commemorate the death anniversary of their near and dear ones or to worship ancestors. What is it: They are either made from wheat flour stuffed with fillings of jam, mung bean paste, dried sausage and so on or from a crust of glutinous rice flour which is roasted and stuffed with the similar ingredients as mentioned above. 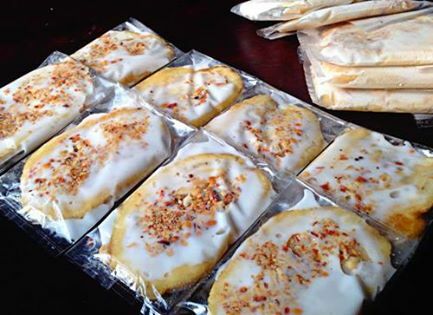 Mostly eaten to celebrate the harvest or Mid-Autumn festival spanning between September and October, the one made from wheat (Banh nuong) is more popular than the sticky rice moon cake (Banh deo). What does it taste like: The taste would be a mixture of sweet and savory, depending on the fillings of the cake. What is it: A magnificent cake, with banana dominating the list of ingredients followed by bread, butter, condensed milk, coconut milk, and sugar. 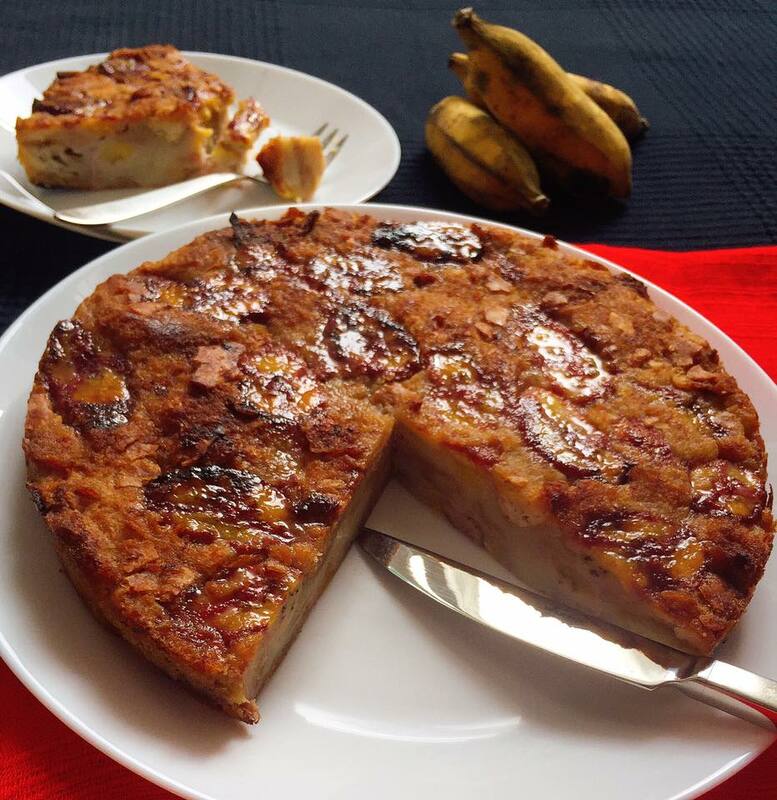 What does it taste like: Sweet, crispy and delicious, with the flavors of banana and coconut adding to its tasty essence, making it a perfect evening snack to relish with a steaming cup of coffee or a glass of chilled wine. What is it: A yummy ice cream prepared from bananas, coconut milk and a dash of roasted peanut. What does it taste like: The sweetness of bananas coupled with the crunchiness of peanut would produce a remarkable sensation the moment you lick it. What is it: A delicious pudding made from sweet corn, coconut milk, and tapioca pearls. 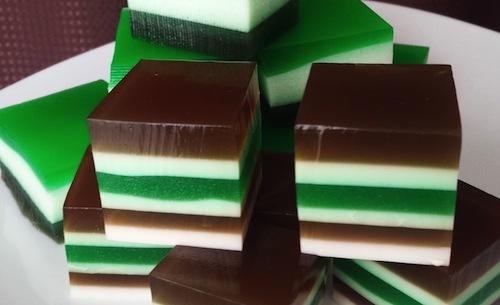 You can even include pandan leaves for a fresh fragrance. What does it taste like: Juicy, chewy and creamy brought about by the sweet corn, coconut milk, and tapioca pearls respectively. 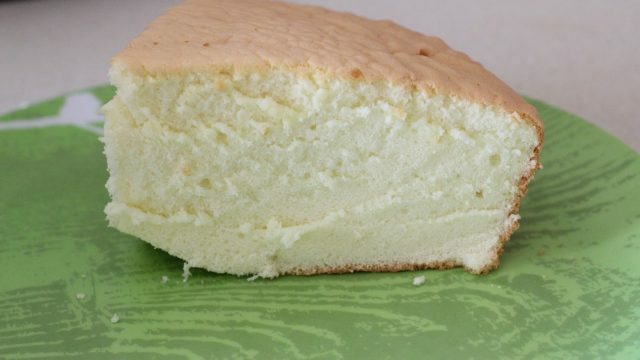 What is it: A soft, spongy cake prepared from vanilla, eggs and a whole lot of other ingredients, often garnished with powdered sugar, a bit of whipped cream as well as fresh berries. 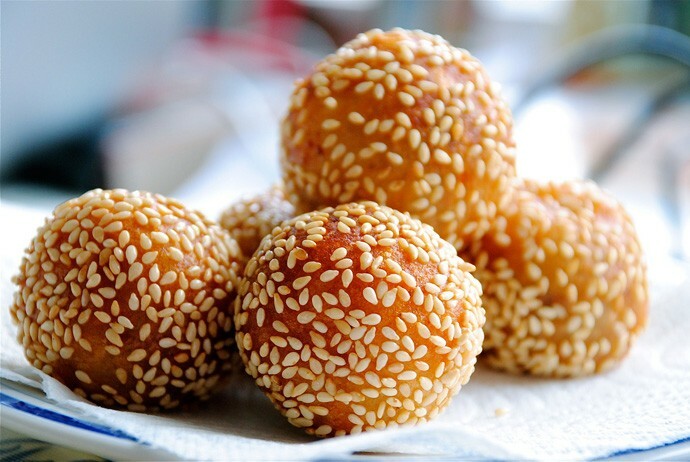 This dessert has mainly been included by the Vietnamese as a result of the French influence who entered the land as traders as early as the 18th century. What does it taste like: Light, spongy and fluffy, a perfect evening snack indeed. 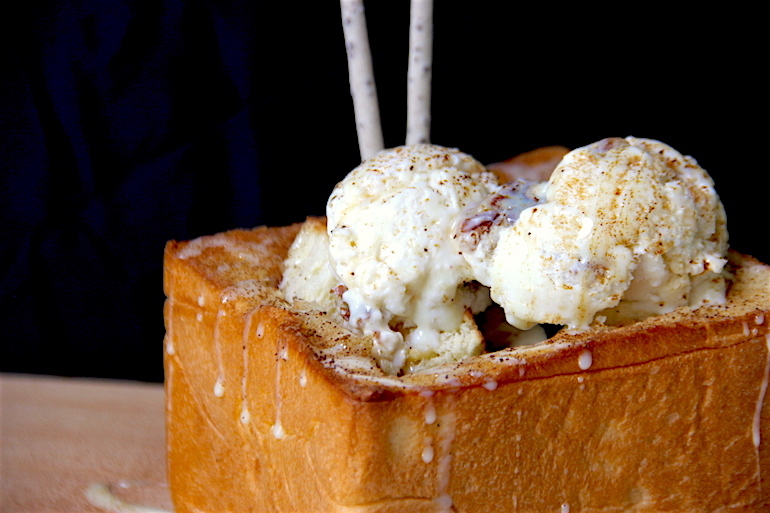 What is it: A toasted bread stuffed with fruits as well as bread cubes and finally seasoned with milk, espresso powder, and ice cream. What does it taste like: A brilliant aroma of coffee, combined with the diverse flavors of several fruits and finally not to forget the chilling ice cream which would melt into your mouth right away. What is it: A traditional Vietnamese steamed cake made from tapioca flour, paste of mung beans and coconut, generally wrapped with leaves. 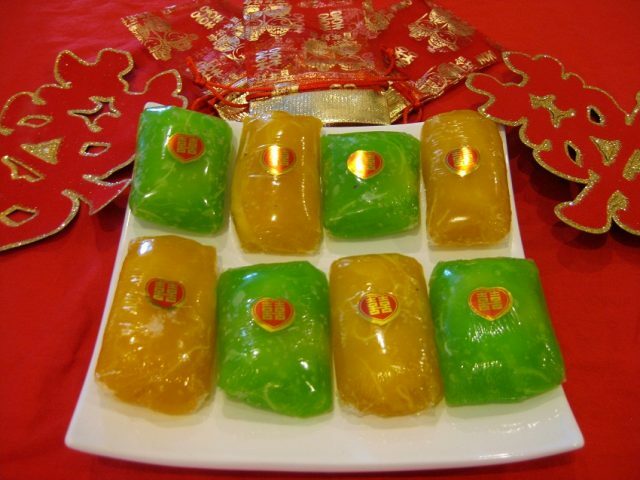 A typical dessert in Vietnamese wedding or engagements primarily offered by the groom’s family, it has an interesting story associated with it. 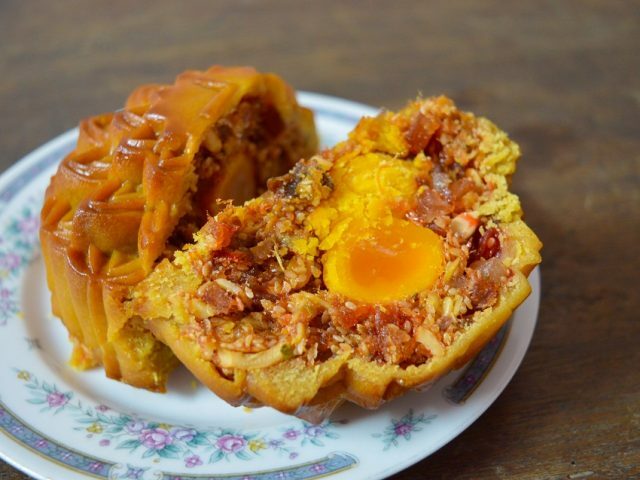 Legend says that Ly Anh Tong of Vietnam named this dessert as the husband and wife cake after his better half sent it to him while he was away on the battle field. This may be the reason why it always occurs in pairs, with red strings tied to it. Though yellow was the traditional color, it also comes in green and red at present. What does it taste like: Sweet and sticky, perfectly signifying the traits of the newlyweds. These exceedingly mouthwatering desserts are a clear reflection of the Vietnamese culture and tradition where a lot of care is taken to maintain the nutritional quotient alongside preparing dishes to satisfy the taste buds.